Yesterday I could not resist to buy this egg “con sorpresa” (with a small gift inside). They remind me so much of my childhood Easter week- ends spent in Bologna with my family! At Easter every year, we would go visit one couple of grand-parents, we had three of them. My sister and I, we were only allowed to read or play quiet games.Unfortunately reading in the car made me sick, so no other choice than watching the fields and houses passing by for hours!! … che noia!!! Later on, my father acquired an Alfa Romeo, so speedy and shiny… what a pleasure, it felt like traveling in a plane! We were happy to go, us, young girls, some big rewards waiting there! First a trip to Florence per Pasquetta, Easter Monday, and the best of all: the Easter Chocolate Egg con Sorpresa!! The cupboard was close, with a key, oh yes no touching before Easter Day! Then like a Christmas gift, Easter day we would finally open it with a lot of excitement and expectation. The eggs, milk or dark chocolate, always from la Cioccolatteria Attibassi, had the most wonderful surprise gifts inside. Sometimes a small bracelet, or a tiny shining wallet, or even earings. No doubt, Zia Rossana, (our aunt Rosanna) had bought them specially for girls! We would break them with care, a sharp knife was needed sometimes. The best part of all though, was how to eat them, without getting an indigestion, piece by piece over two, three or four days sometimes. Over the years, we learned the perfect way and how to indulge making it last longer. When these pieces of thin luxurious chocolate were placed just on your tongue, they will melt very slowly in a festival of fantastic sweet sensations! It was the good chocolate or it is just now a dear childhood memory? I am not sure, what I know is that, since then, no chocolate ever tasted better than that one to me! Happy Easter to every one! 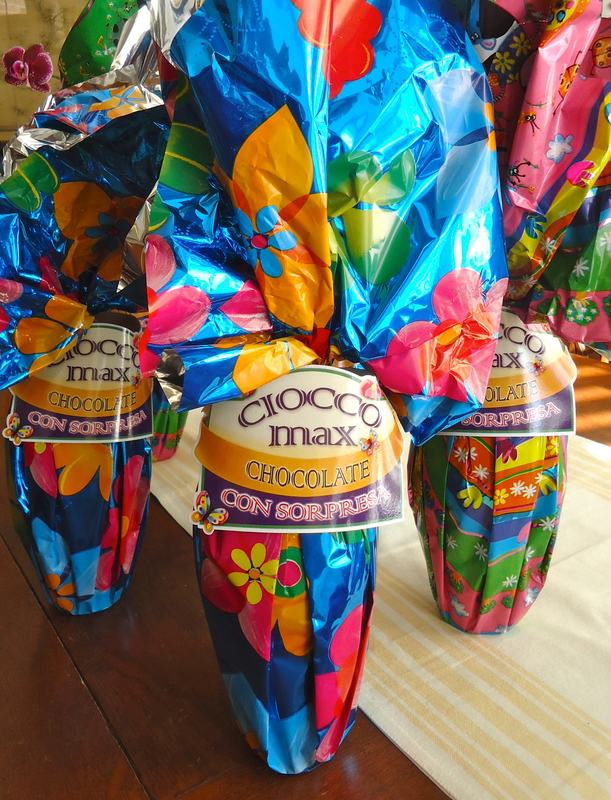 Years back, I owned a chocolate shop and at Easter would always sell the beautifully wrapped chocolate Easter eggs from Italy. They were so pretty and the chocolate was delicious. That is so great to find thru the blogs and Internet nice people like you that understands what was going on…I bet your chocolate shop was a wonderful oasis for all chocolate lovers! Thanks so much for writing!